By Alieu Jallow, 2 years ago. Six Gambian youth entrepreneurs took to the stage at the Independent Stadium in Bakau on Thursday 27 April to pitch their business ideas. The ventures covered a wide range of businesses, from management consulting to handmade Gambian attire and accessories. 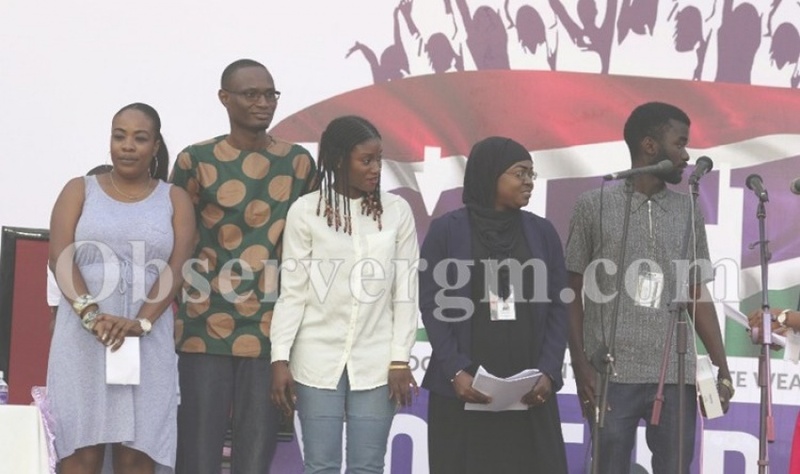 The pitching contest took place during the Youth Day of the International Trade Fair and was organized by The Gambia Chamber of Commerce and Industry (GCCI) in collaboration with the Startup Incubator Gambia and the Youth Empowerment Project (YEP). Ndey Fatou Njie won the panel’s award with her company TiGA, which produces swimwear, leisurewear and accessories. TiGA products stand out with the vibrant colors and African patterns pushing the limits of creativity and style. Hassan Y. Jallow and the team of ASSUTECH, a software company, impressed the audience and won the public’s choice award with their new mobile application DEKA, which facilitates the search for houses and apartments. Both winners were awarded a brand new Dell Laptop and will receive complimentary advisory support from the GCCI. The other finalists included, Serign Modou Njie with Quick Tech, Ebou Mendy with Kameko, Fatou Lette Jallow with SaMu Management Consultancy and Aidiatou Conteh with Daraja. However, the Youth Day promoted entrepreneurship and business, as it helped identify entrepreneurial talent, develop self-confident, effective communication and business presentation skills, connect entrepreneurs to support services they need to startup and help grow their businesses. In her introductory statement, the permanent pecretary of the Ministry of Trade and Employment, Naffie Barry stated; “My ministry is very pleased with the big number of youth businesses showcasing their goods and services at the international trade fair. It’s therefore most appropriate that we celebrate today our young business people”. Meanwhile, the YEP, GCCI and the Start-Up Incubator will continue to work together to expand economic opportunities for youth in The Gambia including through entrepreneurship. The pitching contest was supported by The Gambia Youth Empowerment Project (YEP), a four-year initiative implemented by the International Trade Centre (ITC) and funded by the European Union (EU) Emergency Trust Fund for Africa.